Follow Everton v Newcastle and Aberdeen v Celtic. Double fist pump from the Watford boss, he's happy with that. Right, we're done here but for all the reaction join my colleague Andy Cryer here. Into the first of three minutes of added and this game is heading for a draw. Watford have shut up shop. Heurelho Gomes has been brilliant in this half and he has just produced the save of the game to palm away Diego Costa's goalbound header. Final change for Watford as new signing Mario Suarez is on for his debut, replacing Etienne Capoue. Eden Hazard has certainly injected a bit of creativity into this game and he lifts a cross from the left towards the far post for Diego Costa, who can't quite squeeze the ball home. All Chelsea at the moment. "Hazard should have come on earlier"
Former Chelsea keeper Mark Schwarzer on BBC Radio 5 live: "Hazard should have come on earlier – this match was tailor-made for him. He can tip a game on its head with his skill and his ability." Chelsea then go even closer. It's a fine team move, Willian releasing Eden Hazard on the right and the forward cuts back for Branislav Ivanovic but his fierce close-range drive is superbly denied by Heurelho Gomes. Watford are dipping into the energy reserves and are finally pressing a bit now. With 13 minutes left, they are not too far off from snatching the lead as Ben Watson's corner is met by Sebastian Prodl's header, which is deflected just wide by Branislav Ivanovic. Your wish is Guus Hiddink's command, Charles. Nemanja Matic is hooked and Eden Hazard is on. He's not had the best of seasons but if ever there was a game for him to produce a bit of 2014-15 magic, this one is it. Someone finally takes this game by the scruff of the net and has a go. Oscar leaves Etienne Capoue standing and fizzes an effort from outside the area towards goal, forcing Heurelho Gomes to dive across and push the ball behind for a corner. 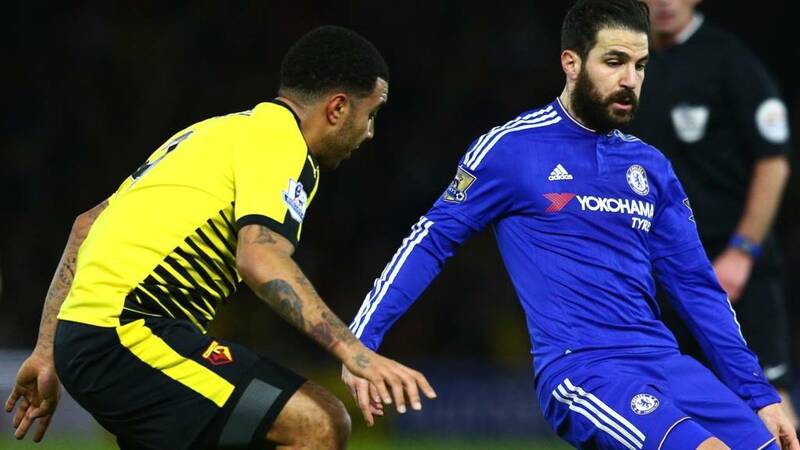 "Mourinho left Chelsea burnt out"
Another change for Watford as Juan Carlos Paredes is replaced by Allan Nyom. Dull, dull game now. Both sides are wasteful in possession and struggling to create anything. Watford have a corner but Ben Watson can't beat the first man as John Obi Mikel heads away. Watford boss Quique Sanchez Flores blinks first and makes a change. Jurado, who disappeared after a bright start, comes off and is replaced by Almen Abdi. Decent hit by Nemanja Matic. He has got what seems like an age to position himself for a looping ball on the edge of the area. Eventually it comes down in front of him and Matic strikes the ball sweetly enough, but straight at Heurelho Gomes. Guus Hiddink leans against the dugout as Eden Hazard warms up close by. Will he be tempted to send on the forward? This game needs a spark from somewhere. "The game needs a goal"
Former Chelsea keeper Mark Schwarzer: "This game needs a goal. The quality of the game has not been the greatest but it has improved in the second half."